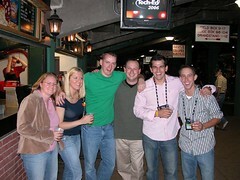 This year's attendee party at TechEd 2006 was at Boston's Fenway Park, home of the Boston RedSox (gee, who didn't know that)? Now, I'm not a huge MLB fan... the last few years I have gotten back into it and I did find myself pulling for Boston in the playoffs the last two years. But that's not the point. 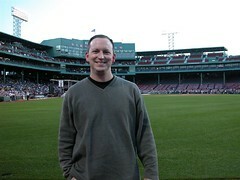 I'm a sports fan at the core, and I fully grasp this truly special historic place called Fenway. 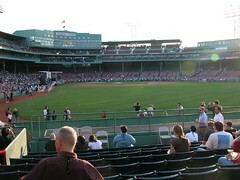 Any sports fan has seen the shots of Carlton Fisk helping his shot steer fair around the foul pole line in left field. 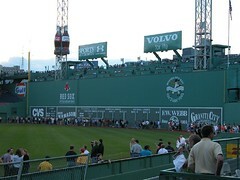 Everyone has seen the Green Monster. Everyone knows it's a special place. 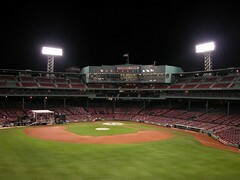 When I heard the party was going to be at Fenway, I was pumped. I didn't realize how special it would be until we started walking up. My friend Greg, Heather, and I dropped our bags at the hotel and took the subway to the nearby station. We then had a 100-150 yard walk to the ballpark. As we walked, I glance over and we're right next to the Cask 'N Flagon! Around the corner, and we're now making our way into the park. We immediately skipped the food and beer lines and went into the stands... that's the first of three times that night I had a strong moment of realization: wow, you're actually in Fenway. See, for my readers outside of the US or those who aren't sports fans, this is one of the true relics from sports, baseball, and America's past. This place is old with none of the modern day benefits... it's over 94 years old, opening in April of 1912. 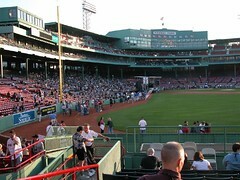 Growing up, I've seen countless highlights of games in Fenway. 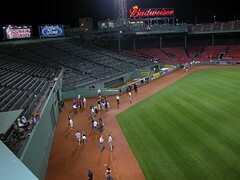 So after grabbing some food and beer, we headed down onto the field (yes, we got to walk the track). 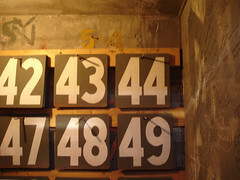 We got to look into the scoreboard and see the score cards hanging up, but what I didn't expect: you could see love notes written on the wall from the 1920's (look at the wall on the right side of the picture below with the number cards)! 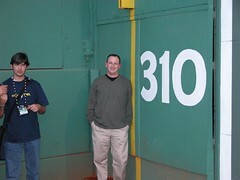 We got to get our pictures taken at Fisk's pole, the visitor's dugout, and from behind home plate. Walking the track and getting the following pictures, that was the second "wow" moment: wow, you're really standing among history. 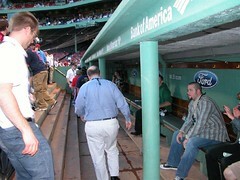 Next, we went under the stands to grab a few beers. There, we met up with Shane and his fiancee Nicole, Jason Madero, Joel Olson, and Nick. Saw a few friends from my last gig at Fidelity as they walked by. 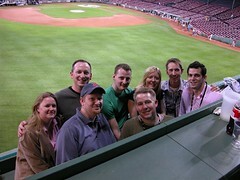 Realizing the concert was over (MSFT hired Train to play from the field), we quickly made it up to the Green Monster. That was the last "wow" moment: you've seen those seats on top of the monster, you've seen pictures from those seats... but it was different being there. 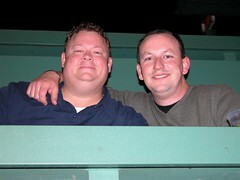 Greg and I sat up on the second row just looking around the field... the park... everything. I didn't want to forget that moment... I have no idea how often people who don't own those seats get to sit up there, but I doubt many have been able to have that experience. It's truly the best seat in the house. You didn't want to leave... you just wanted to absorb and remember every single moment. Before we left, I took the following picture on the left & set my camera down. A few seconds later, a voice over the loud speaker said the party was over and it was time to go home. Then, all the lights went out. I grabbed my camera and took the picture on the right. Talk about lucky, they are almost the exact same shot, just lights vs. no light! 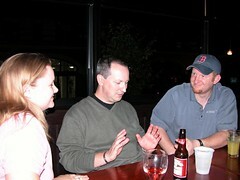 On the way out, we stopped at the Cask 'N Flagon and threw way too many back, but had a blast. Hopefully I didn't bore poor Joel to death! As a sports fan I can list a handful of "sports" experiences that I'll never forget. Last Thursday night is easily one of my top 3... and I wouldn't even consider myself a huge baseball fan, a huge RedSox fan, nor did I even see a single moment of a game last Thursday night (well, except Game 4 of the NBA Finals @ the Cask 'N Flagon). 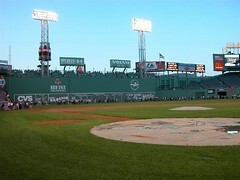 To all you RedSox fans... you Bostonians... before I respected the magic Fenway. Now, I get it... I really get it. Don't build a modern stadium... keep it just the way it is. 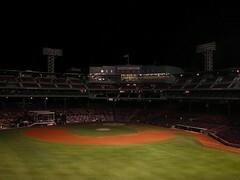 Thank you Fenway and Microsoft... I'll never forget last Thursday night.